Brentwood was the one I liked best of the three places I went to. They have some small residences, and 2-bedroom residences that are different from the others. They showed me the dining area, some areas where they have parties, and they described the activities they offer, and their transportation. The staff member took me around, showed me the facilities, followed up with some phone calls, and invited me to their functions. I think theyre excellent. The food looked good and was well presented. Hi, Thank you for your kind words and for sharing your feedback! Our top priority is creating a great environment and life for our residents. We would be happy to have you join us at our upcoming functions, and we look forward to seeing you again! Brentwood offer 24/7 staff members that can assist in additional things, like medication checks, and making sure the residents are taking their meds. They also have transportation to doctors and events that they have happening. There's no nursing staff, but there's 24/7 staff. It's a locked facility, so they check their residents and take care of them. It's about $1,900 a month; I think that's the baseline. It's very nice, a little bit dated, but it's clean and well-maintained. Brentwood at Elkhart is an awesome place. They have studios and 1- and 2-bedroom apartments. Their activities seem to be in line, and their activities schedule was full, so the people have something to do. They're in close proximity to grocery stores and other convenient places that people might need to go for prescriptions or groceries. The studio was small, but the rooms were spacious. Kelly -- the person who gave us the tour -- was awesome and fantastic. Cheerful, supportive and hard-working staff. Several instances of 'above and beyond' in the short time we've been here. A big turn around here in the last couple months. Much improved, harmony among staff. A great place to call my home. Good staff! Good services! The effort is made to find out what we like! Big improvement. Food is good. Nice management. Friendly and hard working staff is a huge asset to Brentwood at Elkhart. A variety of activities are offered and appreciated. Meals are tasty and servers are kind and helpful. Building is clean, feels safe and secure. I'm very happy to live here! My needs are well met. The staff is very friendly and accommodating! Kay plans very interesting and fun activities. Amber goes out of her way to keep things running smoothly! I find the services efficient. No complaints. The staff is very efficient and caring. There are many interesting and varied programs at the fireside to enjoy. A variety of musical programs often is appreciated. Staff is wonderful, food is very good, resident outings/activities are all geared to keeping us busy and happy. Very satisfied with the services provided here at Brentwood at Elkhart. Things are much better and improving! We are very satisfied with the entire staff and happy to see improvements on a continuing basis. We feel very comfortable here. Brentwood at Elkhart was a really nice huge place with a lot of residents, but it has two levels, so Dad would probably get lost wandering off. They have a lot of activities, a movie room, library and go to a lot of places. You can also have pets in there. There is a pond and some trees, so you can enjoy the outdoors more. My experiences here have been great! I especially love all my friends that live here too. Very good community. The staff here is wonderful. Have been here four months. Am happy with the friendly help and the friendly residents. Very nice apartment. Good food. Good choice on menu. Good entertainment. Good choice of outings. No complaints. I'm very pleased with the present staff. They're caring and try to make this a safe and comfortable home. Everyone goes above and beyond to provide the best quality service to my mother. Very family oriented and caring people. Always a smiling face. Always happy with the services and especially with the employees. I have lived here for twelve years now and find it just as they told me when I came "This is your home" and it has been. My family loves it too. They always say we're glad you're here. I am very pleased with the current staff and their willingness to having an open book policy to listen to the residents. Brentwood at Elkhart seemed clean and nice. Their cafeteria seemed really nice, and the common areas were well-maintained. The individual who showed us around was very helpful. She was able to show us a vacant room, so we got to see what a two-bedroom looked like. Everything seemed nice and clean at Brentwood. The person who set up the tour for us did not make it, and they provided a substitute but that person didn’t have all the answers to our questions. There was plenty of room in the apartment. They have Bingo and they have outings to the grocery stores and different places of interest like field trips. The cost is probably what made us hesitate, they kept giving us different prices so we were not sure what the cost would be but it was more than what we were willing to spend. There was an uncertainty as to the total cost. Brentwood at Elkhart is very well kept, very clean. The dining room is nice, they have three meals a day and it fits my dad's needs perfectly. The place, the people, and the staff of Brentwood were all superb. Everything about it was really good. The staff was outstanding. My grandmother was a resident at Brentwood in Elkhart, Indiana. What I loved about this place was the interaction my grandmother had with staff and other residents. Everyone was so kind and compassionate to each and every person they came across. The staff really takes time out to make sure the residents are happy and enjoying themselves on a daily basis. They get well balanced meals and it is a very clean facility. Whenever I go there, I feel like I am welcome and I do not feel like I am out of place. They try their best to make it feel like a real home to the residents. I gave it 4 stars because of one lousy experience. I happen to go one time where another resident was having a rough day. Instead of taking him into a private area to talk to him and try to calm him, they had him sitting in the community room for everyone to see and hear his troubles. I found it kind of inappropriate and thought it could have been handled better. I mentioned it to the house manager and I have not seen activity like that again. Otherwise, it is a wonderful place. I am a paramedic that has been in and out of this facility numerous times on emergency medical calls. Every time I have been there the staff has been at the doors to great me and to ensure that we are able to find the room that our patient is in. They do this buy walking with us to the residents room. The staff members are very friendly and seem to genuinely care about the residents of this community. This retirement home is one of the cleanest and well maintained communities in the city. They keep all of the carpets cleaned during the winter months and I do not think I have ever noticed anything out of place. I am nothing but impressed with Brentwood. Along with the friendly staff there are friendly residents. Most residents go out of their way to say hi or to check on the patients we are wheeling out on a gurney. Overall this seems like a great retirement community and I would be completely comfortable with one of my family members or even myself living here after retirement. Brentwood has numerous activities to offer for seniors. They have daily activities including bingo, church, movie night, etc. The staff was pleasant and seemed to respond to seniors appropriately. 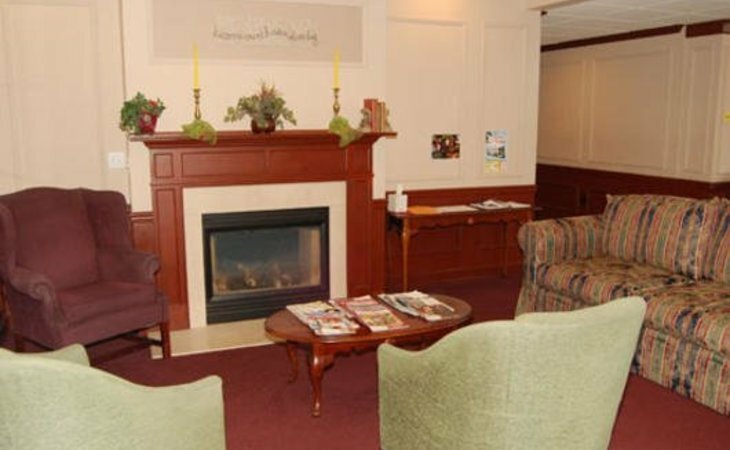 Describe the overall population of independent living residents at Brentwood at Elkhart. What is their average age? What are their favorite things to do? 85 is the average age. However, we have residents as young as 60's and old as 99. Some prefer to relax and just watch television, while other like to be on the go. We cater to all. What are some recent off-site events that the community activity director at Brentwood at Elkhart has organized? What transportation services does Brentwood at Elkhart offer to independent living residents? What makes the chef or dining program at Brentwood at Elkhart exceptional? What kind of menu can independent living residents expect? Because we are independent living our residents have the luxury of restaurant style dining with daily specials and ordering off the menu. Courtyards with gazebo, separate dog walk area, Bistro, Chapel, Work-out area, Game room, library, beauty salon, laundry facilities. What safety features or security measures does Brentwood at Elkhart offer to independent living residents? all exits are locked at all times, security camera monitoring and 24/7 front desk concierge. If Brentwood at Elkhart accepts dogs or cats, what indoor/outdoor areas can they enjoy? Lots of grassy area to walk the pets and a separate off leash courtyard area for the dogs. Does Brentwood at Elkhart work with an agency or registry to provide nursing and medical assistance as needed? While we do not offer any hands on clinical care, Home Care services are available in the community. Brentwood at Elkhart provides the best of all worlds to our residents – whatever their need may be. Our independent residents enjoy active, engaging lifestyles that promote health, well-being, and independence, along with a host of services and amenities, and peace of mind with additional care offered on campus. Independent residents enjoy a variety of apartments and convenient services that make life truly worry-free … think transportation, housekeeping, etc. Residents also benefit from healthy restaurant-style dining – serving three delicious meals a day. Residents lead active, enriching lives! With so many specialized programs and engaging activities offered every day, there’s always something fun to do – with interesting people who share your passions and staff dedicated to ensuring residents have all they want and everything they need. Brentwood at Elkhart is an 88 apartment Independent Living community, providing exemplary senior housing to the residents of Indiana. What should caregivers and potential residents know about Brentwood at Elkhart?